Share the post "Les Roches Hospitality School run the Lausanne Marathon"
Students and staff members of Les Roches achieved a fantastic performance at the Lausanne Marathon on 31 October. 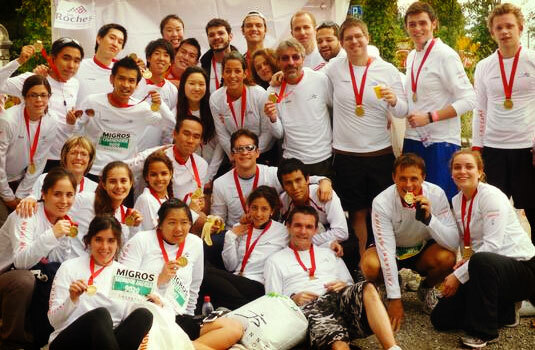 On a grey Halloween Sunday, 33 students and 5 staff decided to take to the road and run the 10 km race in the Swiss city. Students Service Officer Claire Jeannerat was even running the 20 km race. In the team rankings, Les Roches finished 6th out of 40 teams with 4: 21 hours in total. This year, Clarissa Jakubczik won the women’s race between Les Roches female students and Julian Bruns arrived 1st of male students. In addition, Radu Eremia, Les Roches Sports coordinator, added an internal challenge to the competition. The students had to try to beat him but in 12 races, no students have ever beaten our sports coach! Well done! Go on Facebook on the Sports department group to find out more about their activities.